Although Froome kept a stiff upper lip during the Giro and Tour, he admits the scandal surrounding his Salbutamol case weighed on him. Chris Froome (Sky) said his long-running Salbutamol case kept him from being at his best in this summer’s Tour de France. Speaking to VeloNews in a telephone interview, Froome admitted that the Salbutamol case was more of a distraction than he wanted to admit. Froome’s comments to VeloNews, as part of a larger interview looking back at his 2018 season that will be featured in an upcoming print edition, reveal just how much the Salbutamol case affected him both on and off the bike. Froome was eventually cleared just days before the start of the 2018 Tour, but the emotional drain took its toll. 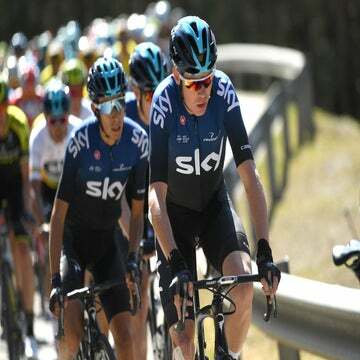 Froome fell short of winning a record-tying fifth yellow jersey, while Sky teammate Geraint Thomas rode to victory in Paris. Froome’s case dragged on for months once it was leaked to the media last December and dominated headlines throughout the season. Froome defied calls to step down as the case played out and doggedly won the Giro d’Italia with a dramatic, late-race coup. Though he put up a strong public face of a mix of defiance and business as usual, he admitted the building tension and stress played a negative factor throughout his season. Froome, 33, stopped short of saying the ongoing drama cost him a record-tying fifth yellow jersey and was quick to tip his hat to Thomas. But he admitted the burden of the case and the possibility of a racing ban weighed heavily on him the closer the got to the Tour. Though some critics accuse Froome of doing much worse than Salbutamol, an asthma treatment allowed under certain conditions by the WADA code, the Sky rider insists he is racing and winning within the rules. “It was tough, really tough,” Froome continued. “Especially when my credibility as a clean sportsman was questioned. That is something that I hold quite dear to myself. Sky still hasn’t spelled out its 2019 racing program, but Froome said he is relieved that the Salbutamol case won’t be hanging over his upcoming campaign like it was during the past several months.